Two weeks ago, we took a puzzly detour into the world of comic strips and explored all the puzzly references we could find in the annals of Garfield publishing history. In the course of compiling those comics, I stumbled across many others that referenced crosswords and other puzzles. As it turns out, plenty of iconic comic strips have had something to say about puzzles. It makes sense, really, given that crosswords and comic strips are both synonymous with reading the newspaper every day. So naturally, I couldn’t resist putting some comic strips aside for the PuzzleNation readership to enjoy. We start off today with this Fred Basset comic strip, wherein a mischievous dog saves the most important part of the paper for his owner. In this Beetle Bailey strip, we’re not only reminded of the true power behind the General, but of the power of crosswords to eat up your free time. 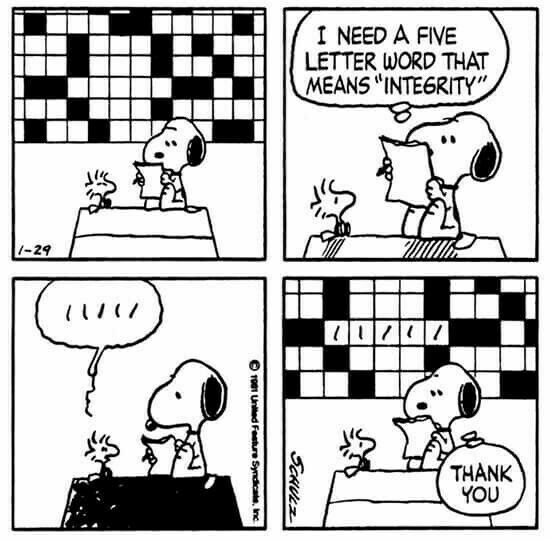 In the Peanuts comics, many of Snoopy’s best jokes are visual gags, given that most of the other characters can’t understand him. In this case, the joke is on us, as Snoopy and Woodstock crack a curious crossword entry together. There’s a marvelous sense of accomplishment that comes with solving your first crossword. In this comic from Mother Goose and Grimm, the celebration is a bit more enthusiastic. 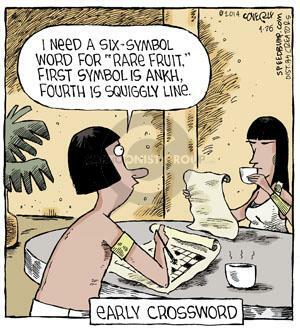 Many comic strips have fun with the difficulty of crosswords or the wordplay involved in the cluing. But this one by J. Gravelle presents the trouble you can get into by making assumptions while letters are still missing. In this comic from John Deering’s Strange Brew, the human condition — and the rat condition — are summed up in one poignant quote. 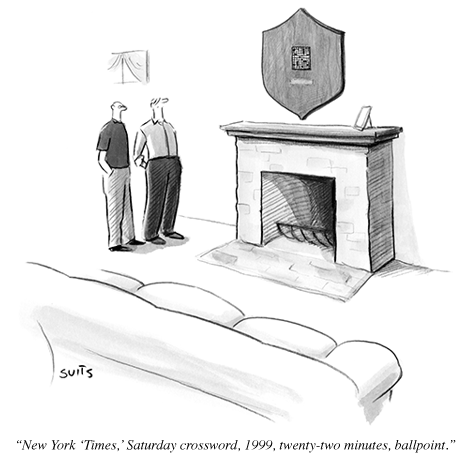 And speaking of The New York Times crossword… we’ve all felt like this at one point or another. Finally, we get a little meta with this one. But it makes sense, given that the funnies page and the daily crossword are usually in close proximity. I hope you enjoyed this brief sojourn into comic strip — and puzzle — history. Do you have any comic strips mentioning puzzles that we missed? Let us know! We’d love to hear from you! Puzzles are ubiquitous. Once you start looking around for them, you’ll find them in every nook and cranny of popular culture. Sometimes, they’re the basis for an entire episode of television, as in Brooklyn Nine-Nine or Parks and Rec. Sometimes, they serve as a linchpin metaphor, as they did in Sleepy Hollow. Other times, they’re good for a funny aside, as in Gilmore Girls, or as a prop to reveal deeper character insight, as on The West Wing. Over the years, I’ve seen puzzles incorporated into storytelling in dozens of ways. 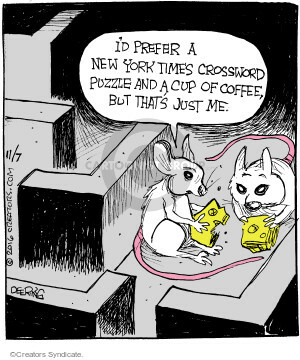 So I shouldn’t have been surprised to stumble across puzzle references where I least expected them: the funny pages. Yes, they’re such a part of the cultural fabric that they’ve even infiltrated comic strips. Now, it’s meant to be funny, but I think any puzzler who has stood onstage in front of a whiteboard at ACPT, Lollapuzzoola, or another crossword tournament would agree with Jon over Garfield here. That was one example. As it turns out, when you start digging, you find crossword gags strewn through the Garfield comics. That’s a pretty simple gag, but it’s also a nice bonding moment for Jon and Garfield, as Jon’s rampant procrastination dovetails nicely with Garfield’s bottomless love for Italian food. If you ask me, a cookie and a crossword puzzle sounds like an excellent way to spend time with someone interesting. But I’m biased. I love cookies. But it’s not just crosswords. Sudoku has gotten a fair amount of attention in the Garfield strip over the years. That’s understandable, as it’s one of the most recognizable pencil-and-paper puzzles in the world. And as someone who isn’t the fastest Sudoku solver in the world, this series of comics from January of 2010 (an entire week’s worth!) speaks to me. I get it, Jon. I get it. Honestly, it makes sense that Odie would have Sudoku wired. He’s a puzzle dog. He’s been appearing in crossword grids for years. There’s a lovely callback to that previous crossword gag. Finally, Jon triumphs! I admire both his resilience and his unwillingness to give up. Though, given that it took a week to complete a Sudoku, maybe Jon should stick to other puzzles. Heck, our friends at Penny/Dell Puzzles have the perfect book for him to try out.